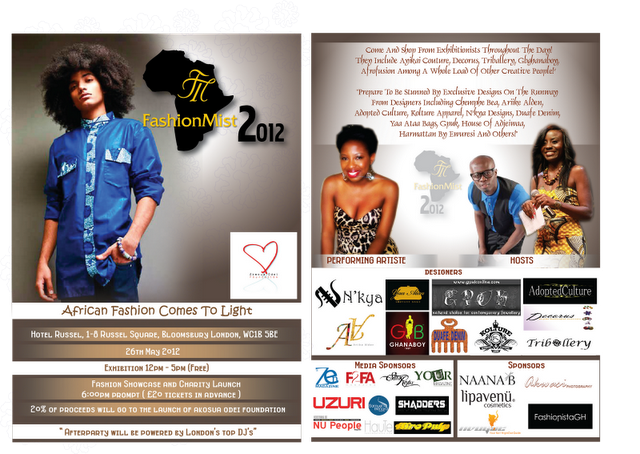 If you love African Fashion then it's a must that you attend Fashion Mist 2012. Following on from the successful maiden event last year. Fashion Mist is back again for a 2nd season. Taking place at the magnificent Hotel Russell, London on Saturday 26th May 2012. Fashion Mist aim is to showcase on one platform emerging young designers of African origin who reflect the continent’s creativity and the use of African textiles in their products to infuse it with a modern Western flair. This is in the form of clothes, accessories to name a few. 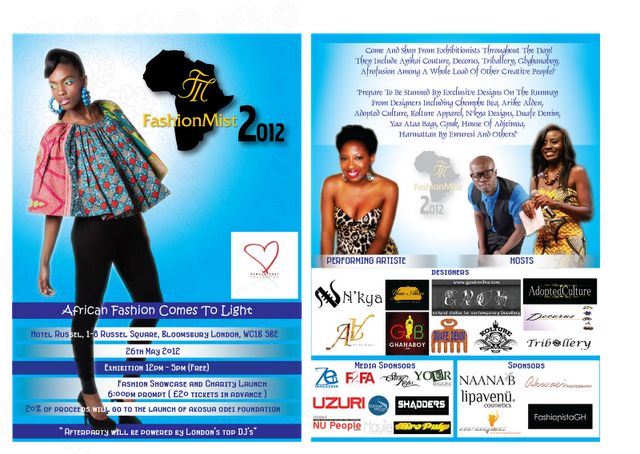 It also seeks to create a network for the designers to interact and inspire all Fashionista’s in attendance. Fashion Mist will take part in 2 parts. First up: Open to the general public for free from 12-5 pm, you can feast your eyes on the fabulous wearable pieces and accessories that will be on sale, The exhibition will include designers like Ayikai Couture, Decorus, AfroFusion Designs, Triballery, GBGhanaBoy, Lipavenu, Celebrity Hair, House of Loulee and lots more including most of the designers from the catwalk show. The fashion showcase is indeed the highlight and starts from 6pm and is sure to be a memorable night of amazing fashion, entertainment and glamour. A selection of designers will be showcasing their collections exclusively to a seated ticketed audience. Labels confirmed for the catwalk include Chemphe Bea, N’kya Designs, Ariike Alden, Adopted Culture, YaaAtaa Couture Bags, Duafe Denim, House of Adjeiwaa, GPUK, Kolture Apparel and Harmattan by Ewuresi Stefanie Larmie and Bertha, young up and coming Ghanaian talent, will provide entertainment on the night.